It takes ages for Cecile Carré to work through the stacks of family sketchbooks in their Barcelona home. With five artists in the family there are a lot of pages. 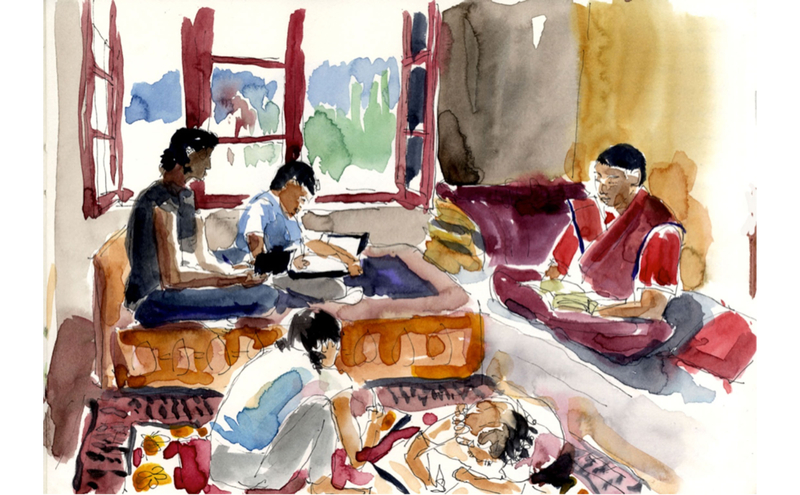 The dark lines and bright watercolours trace their family travels around the world, a remote village in Bali, markets in Morocco, a monastery in Ladahk. The images show the colour and texture of the places they’ve seen, but just as importantly, they chart the growth of their three children, Gaspard (13), Louise (11) and Gabriel (7). 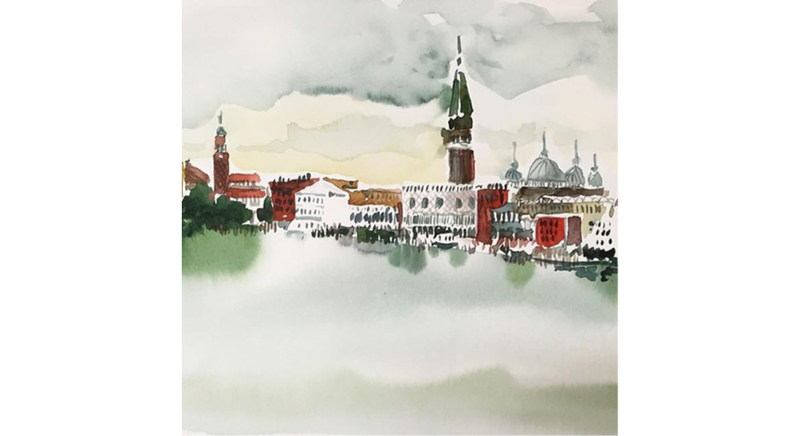 Since the year Bruno and Cecile spent as newlyweds traveling around the world, the family has committed to regular, one to two month voyages, and to drawing what they see. Nearly every day on the road finds them sitting, sometimes separately but most often as a family, for 45 minutes to an hour, drawing the scene in front of them. There’s a sense of obligation to the task, creating a daily rhythm that more closely resembles the patterns of normal life. You wake, dress and eat, then work. 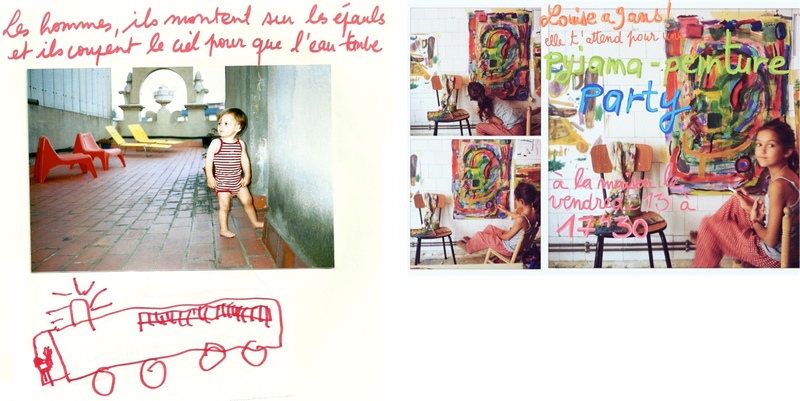 The kids can paint or not, says Cecile, but they have to respect the moment and the time. They don’t ask to leave. 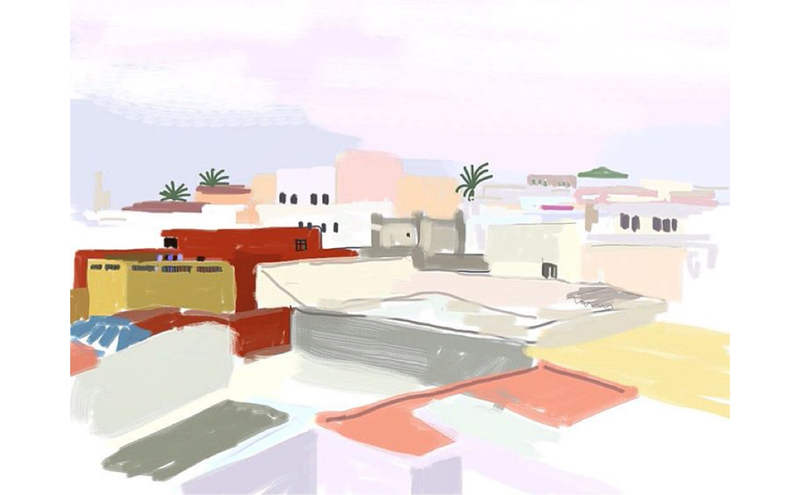 Drawing the scene before you is different than taking a photograph, says Bruno. He calls a sketch the opposite of a selfie. “Nobody takes the time to see and feel, when taking a quick photo. 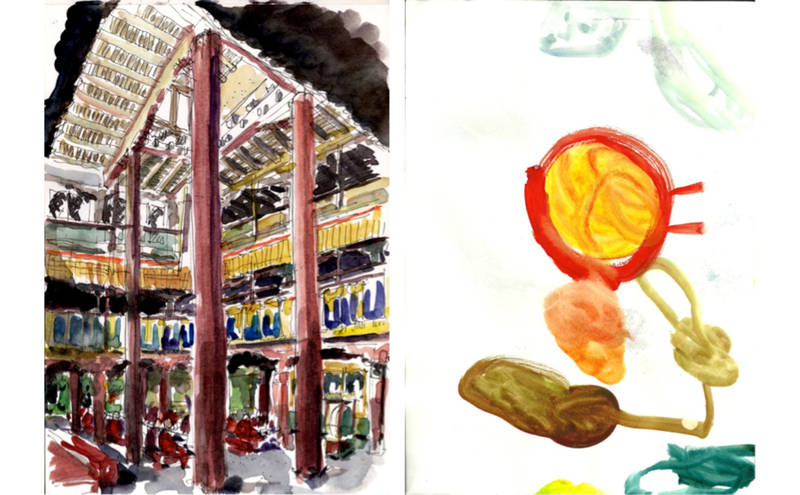 To draw and to sketch is three to four hours. 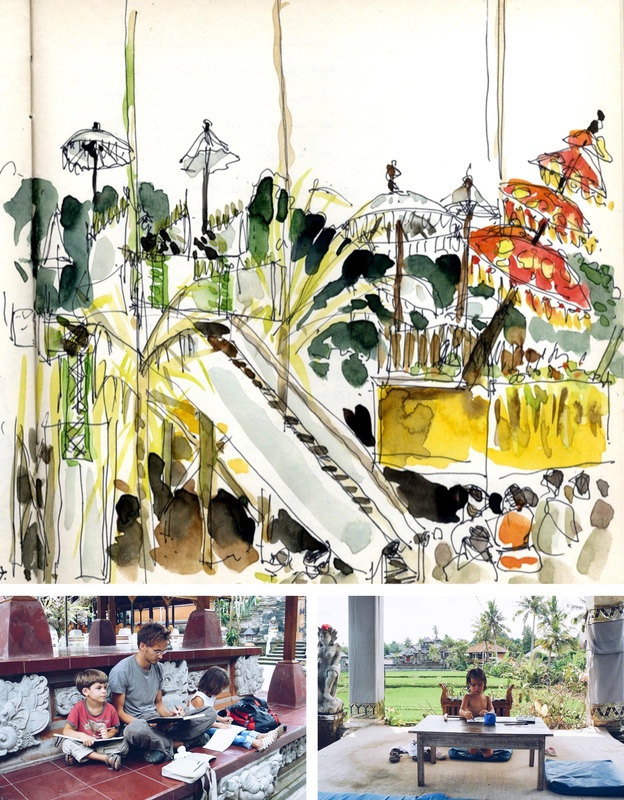 We take the time to understand.” Rather than passing through a scene, snapping photos on the way by, sketching requires patience and a lot of time. You blend, to some degree, into the scenery. New things reveal themselves. In the center of the page is Gaspard, blonde hair and ruddy red skin, a blue t-shirt with a pair of sunglasses hanging from the neck. Surrounding him on all sides, hemming him in, is a flood of strangers, all with dark hair, some wearing smiles but others looking shocked or bemused. 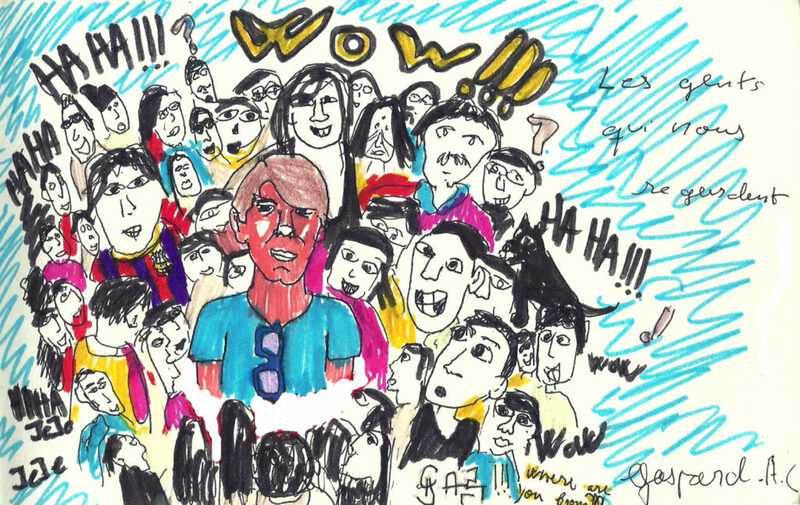 The words “HAHAHA”, “WOW” and simply “?” are scattered through the crowd. Gaspard himself looks calm, resigned to his role as spectacle. You can’t tell if he’s enjoying the attention or not. He’s titled the piece “Les Gents Qui Nous Regardent”, the people watching us. 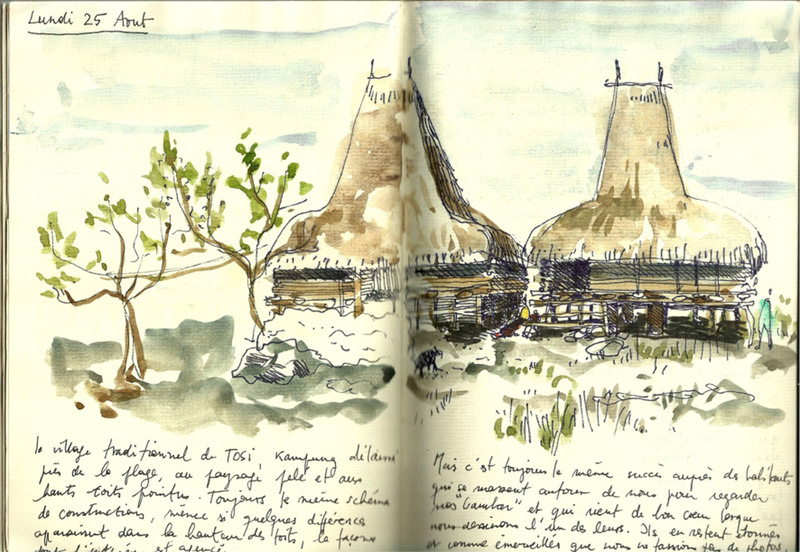 Gaspard made the sketch during a visit to Dawei, a sleepy coastal city on the Burmese side of the Malay Peninsula. With the country of Myanmar only opening to visitors in 2013, Cecile Carré, Bruno Conigliano and their three children made an impression during their stay. 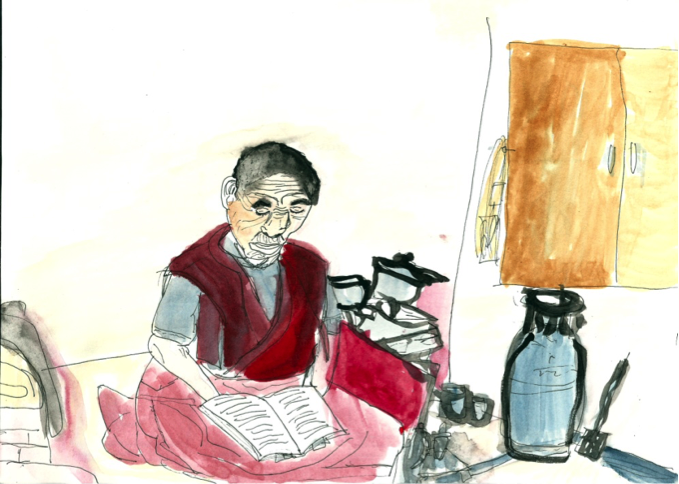 But as a family of five, habitually traveling far from the typical tourist path, each of them carrying their own sketchpads, watercolours and pencils, they were used to drawing some attention. But something had shifted for Gaspard on this trip. His sketches catch the journey into adolescence, and the challenges of growing into your own independence. Traveling with children, says Bruno, may be physically more difficult when they’re younger, but it’s still easier because they don’t give opinions. At 13, Gaspard’s developing interests are taking shape, and they don’t look exactly like his parents had hoped. “We noticed during the last trip,” says Bruno, “that he was not interested at all in the local people. He doesn’t want to see the local market and the dirty things, the poor things. After ten monasteries he says enough. Now he wants to see modern countries, nice clothes, big buildings.” Gaspard’s favourite part of the journey through Thailand and Myanmar? The Apple store in Bangkok. For the next trip, though, they will be looking to compromise. As the kids have grown the importance of common language has increased. “Whey they’re very small, like three or four years old,” says Cecile, “they can have a relationship with others which is about the gestures, the eyes. When they are 10 and 11 they are mostly just with the parents, with the family. But when they get to be about 13 it’s not enough to just be in the family. They need to interact with others. And they need to be able to communicate.” The kids, all three of them, speak French, Spanish and Catalan fluently. So there are a lot of options. But with each at a different stage of life, their needs are different as well. Louise has been asking for another hard-road trip, maybe this time to Sulawesi. And for Gaspard making new friends may not be enough. As he enters his teen years his friend group has become tighter, a circle, stitched together on social media, hand sewn by smartphone. It’s intense, and decidedly outside the bounds of the family. “In two years I don’t think he has ever called us,” says Bruno. “In fact I don’t think he has even one time used the phone as a phone…” Staying connected is critical to Gaspard, and a month away is a lifetime. On the next trip he’s asked if he can bring a friend. Screen time and balance are active discussions in the house. Bruno, especially, finds Gaspard’s attachment to his phone frustrating. But the couple also remember their own teenage years, the desire to connect, the importance of having the same jeans as your friends, the pressure to keep up that continues into adulthood. I’m talking with them on Skype and Bruno is telling me that, though the tools were different when we were growing up, the pressures are the same and we need to be accepting of the way our kids will grow. Practically, we need to learn how to integrate the phone without it being too annoying for the rest of the family. Cecile throws her arms around Bruno, laughing. “I’m going to record Bruno saying this… he can get so hysterical!” Bruno smiles, grudgingly. What imprint will it leave on them, I wonder? Tolerance? Curiosity? Self-Confidence? For more from Bruno and Cecile, check out this terrific article by Behomm, or click their names above to catch them on Instagram.